Preserve a snow crystal in resin and you can share it with friends and family in the comfort of your living room – your very own personal snowflake fossil. 1) A tube or two of thin liquid superglue—not the gel type—which you can find at your local drugstore or hardware store. 2) Some glass microscope slides and cover slips, which are readily available online, often both together in a box for less than $10. 3) A small paintbrush, the smaller the better. 4) A piece of dark cardboard or dark cloth. Take all these items outside so they get cold, but away from falling snow—for example in an unheated garage, a backyard shed, or just under an eave. 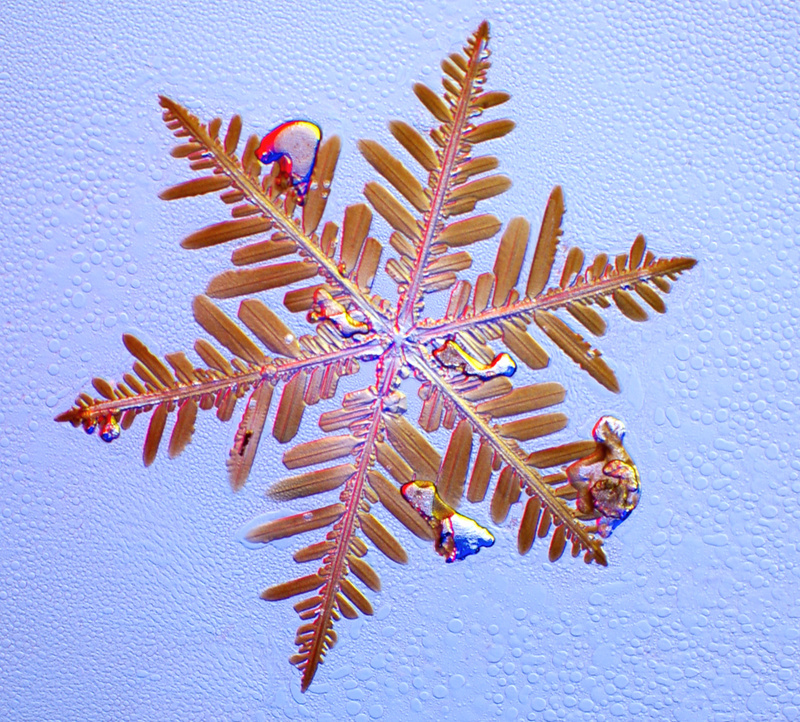 When snow is falling, let some crystals land on the cardboard and have a look at what nature is providing. Use your magnifier for a better view. When you see an outstanding crystal, gently pick it up with the paintbrush (it’s easier than it sounds) and place it on a clean glass slide. Carefully add a good-sized drop of cold superglue right on top of the crystal, and place a cover slip on top of that. You may trap an air bubble or two along with your snow crystal; that's okay. You can see some air bubbles in these two examples. All this has to be done outside in the cold. You have to be careful that heat from your hands doesn't melt the crystal, and even just breathing on your snowflake can be detrimental. If you find that the crystals are melting no matter what you do, then you may just have to wait for a colder day. Handling snowflakes is generally easier in colder conditions; it can be downright frustrating when the temperature is just below freezing. Finally, let the glue harden while it remains at sub-freezing temperatures, which may take up to a week. If the weather is going to stay cold, you can leave your slides outside in a sheltered spot. If not, pop them in your kitchen freezer. Once the glue hardens, the slides can be brought to room temperature. 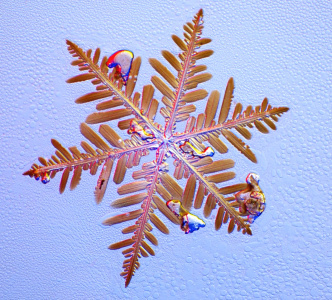 Your fossilized snowflakes, like insects trapped in amber, should last indefinitely.